A quick mid-week dinner that is also indulgent. In a large frying pan, heat the oil. Add the courgette ribbons and cook until they become softer and reduced in volume. Meanwhile, cook the gnocchi according to the pack instructions and set aside. Add the red pepper flakes, spring onions, lemon zest, mascarpone, and half the parmesan to the courgettes, stir, and cook for a few more minutes. The mascarpone should dissolve into a creamy sauce. 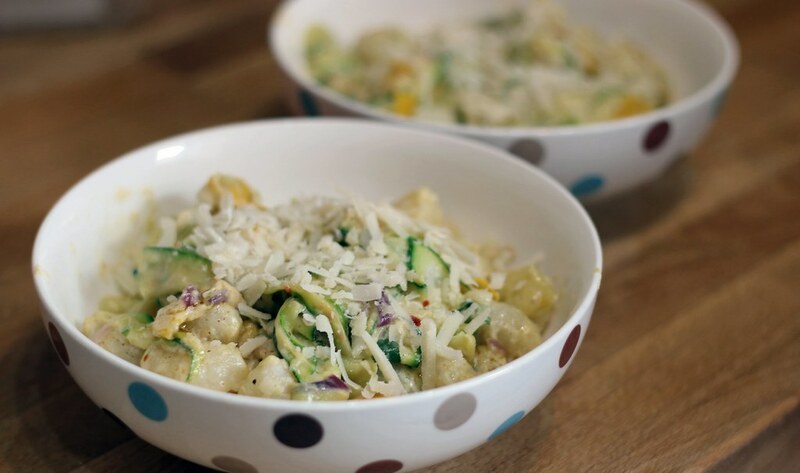 Add the gnocchi to the courgette mixture and season to taste. Cook for a further minute and then serve immediately. Top with the remaining parmesan and serve with a green salad.